“It’s not fair!” apparently has multiple uses and shows up in all kinds of unexpected places – at bedtime, at dinnertime, at times when it appears that his brother receives anything slightly different from what he has, and, one of my personal favorites, when we’re stuck at a red light and can’t get moving to where we’re going. While he was in one of his “It’s not fair!” moods the other day, and no insight or explanation I could conjure up helped him see otherwise, I stepped back for a moment and started thinking that maybe I was really missing what he was trying to relay. Well, isn’t that something?! “It’s not fair!”, it turns out, is possibly not just an irrational statement from the mouth of a first grader, but a cry out from the heart when something just doesn’t feel good. No wonder all the explanations and rationalizations don’t make “It’s not fair!” feel better. And, if a six year old finds some sort of relief in shouting “It’s not fair!”, why is it that we adults tend to drop this phrase from our vocabulary? I hate to admit it, but I actually have “It’s not fair!” thoughts. In fact, this year in particular, I have had a million “It’s not fair!” moments. Oh, trust me, I usually keep them wrapped tightly inside. After all, how silly would I look if I put on my pouty face and uttered those three words loudly to the universe? Perhaps very silly – however, I wonder what it’s looking like on the inside of me when I keep this mantra safely under wraps. Possibly, my six year old grandson has, once again, been my personal little guru. Maybe he’s been trying to teach me that sometimes irrational rantings are just what we need to cleanse our souls. So, I’m going to reconsider “It’s not fair!”. In fact, I’m thinking I might need a date with a rooftop and a megaphone – a place and a voice to shout out with all my might “IT’S NOT FAIR!”. 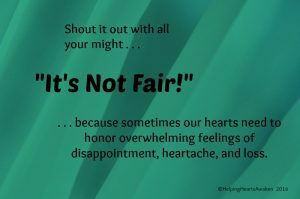 Not because I’m going to get an answer, an explanation, or some insight as to why the world works the way it does, but simply because sometimes our hearts need to honor overwhelming feelings of disappointment, heartache, and loss. Sometimes we need to be as irrational and exceptional as a little six year old guru named Liam. Thank you buddy. It’s not fair my friend. Thank you for this. Hugs. Thanks, Lori – hugs back. It’s been a “it’s not fair” past six and a half months! Very proud of you Sis!